Mount Everest. It’s a name that elicits thoughts of adventure and challenge, glory and defeat, and nature as her absolute most raw and real. For these reasons it makes a fantastic unit study. I put together this study, it is quite interesting, with lots of cool lessons that cross curriculum. But the highlight? Making Kendal Mint Cakes, just like Sir Edmond Hillary and Sirdar Tenzing ate when they became the first to reach the summit. Our unit study involved using lots of different materials. Through our study we explored biographies, geography, science, history plus kitchen science! This was a fantastic study to let the kids take the lead. There were so many different directions we could take our lessons. TED-Ed is always such a great resource when I am looking for lesson materials. You can find a video with lesson ideas and questions to help you kick things off with your studies. Dr. Jane Dyson created this award winning film. It is a captivating look into India and life in the Himilayas. Since I’m teaching a variety of ages and levels of ability I brought in a many different types of books. Any unit study that involves eats sweets is bound to be a huge hit and this one is no different. 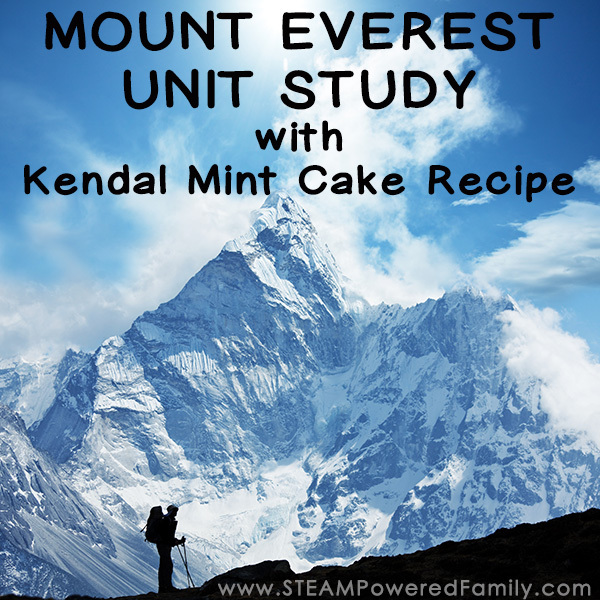 As part of our unit study we made Kendal Mint Cake. Now the name is misleading as this confection is not a cake but a high energy bar. This minty treat has been used as a source of energy by hikers and mountaineers in the UK Lake District for over a 150 years. It was used by Sir Edmund Hillary and Sirdar Tenzing in 1953 when they successfully climbed Mount Everest and by Shackleton’s Antarctic Expedition 1914-17. It is widely acknowledged that Joseph Wiper came up with the recipe by mistake in 1869 in a small town called Kendal, in the Lake District in England. The story goes that he was making glacier mints (Glacier mints are a hard candy popular in England) and he messed up the timing. 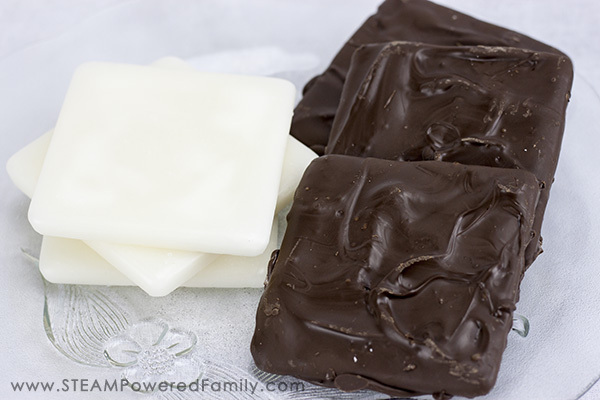 Instead he created this brittle peppermint bar with a wonderful creamy taste as it melts on the tongue. As with Rock Candy and our Geodes, we are working with a supersaturated syrup. 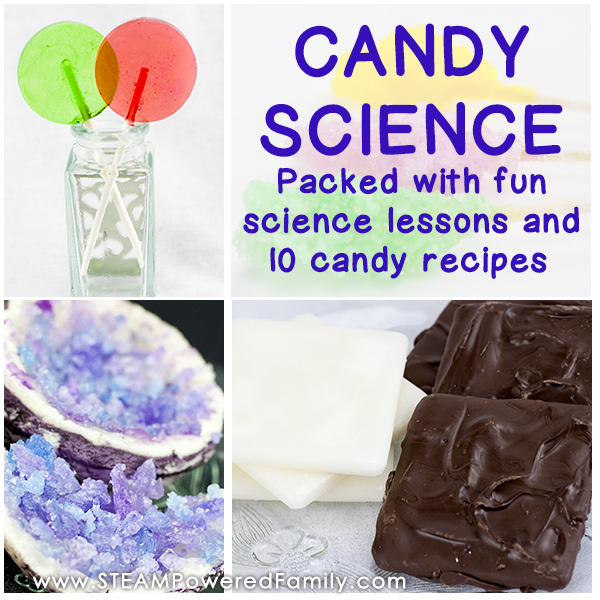 To learn more about the science behind candy making make sure you read our cornerstone piece on Candy Science. In that article we explore chemistry, crystallization, the effect of temperature and altitude, and so much more. 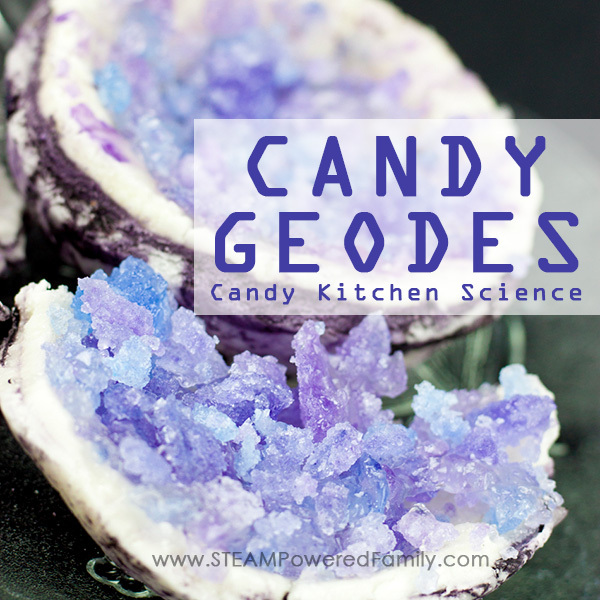 In this recipe, we take the syrup to 115C (240F), known as soft ball in candy terms, then allow the mixture to cool so that the sugar molecules start to form into crystals. Then we beat the mixture to force the clusters into fine crystals which will give the Kendal mint its unique creamy taste. The trick to making this candy/energy bar is to get the temperature right to ensure the proper crystallization process happens, then the beating of the mixture after it comes off the heat. I also found using a dry weight scale for measuring sugar to be the most accurate. I used measuring spoons for the glucose and cold water. 150 mls of cold water. Put all the ingredients except for the peppermint oil into the saucepan. Bring to the mixture to boil, stirring constantly. Once it boils, lower the heat to maintain a gentle boil and stop stirring the mixture. Attach the thermometer so that it rests near but not on the bottom of the pan (if the thermometer rests against the pan it will read the temperature of the metal pan and not the sugar and this will skew your results). Boil on medium heat until the temp on the thermometer reaches 115C (240F) or soft ball consistency (this will be marked on good candy thermometers). Add the peppermint drops and pour the mixture into a bowl. Beat with a strong whisk for a few minutes until the sugar starts to turn milky. BE CAREFUL! THIS MIXTURE IS EXTREMELY HOT AND CAN CAUSE SERIOUS BURNS IF YOU SPLASH ANY ONTO YOURSELF. 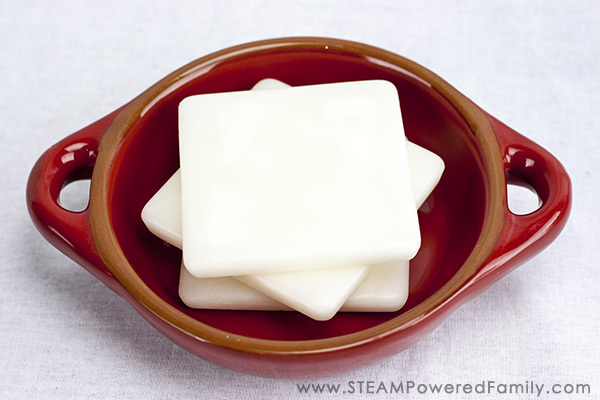 Remember when working with supersaturated sugar solutions, burns can easily happen. These steps should be done only by a responsible adult or with an older teen under adult supervision. Always use common sense and stay safe when doing kitchen science. Pour into an 8” disposable tin foil tray to set. As it hardens score the top to make bars so that it is easy to snap when it’s cold. Break into bars and enjoy! If you want to take things up a bit, you can then dip them in chocolate. This is my favourite! Want to know more about Kendal Cake? 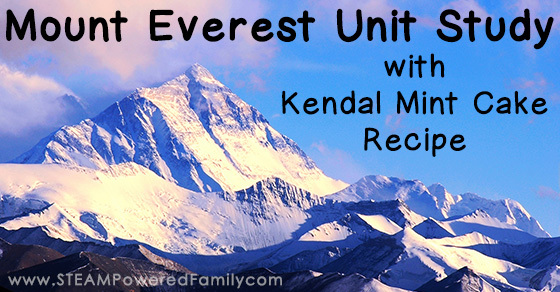 Learning about the Himilayas, India, Geology, Mountaineers… that was all fun and exciting, but my kids LOVED the Kendal Mint Cakes. 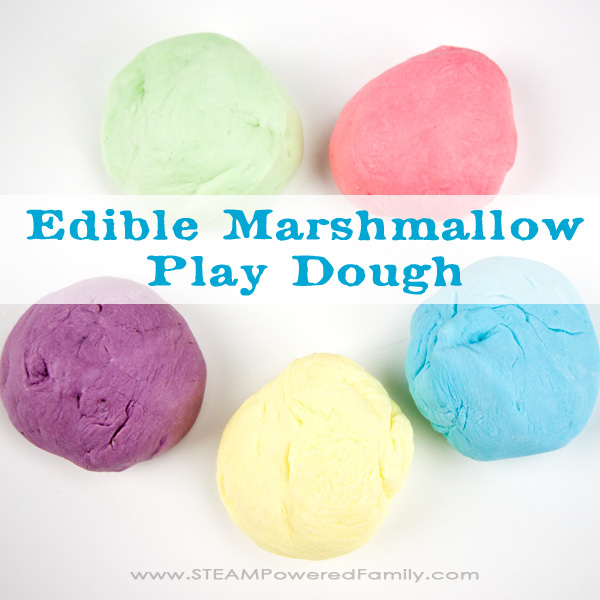 So if yours also loved these treats here are a couple of articles that talk more about it. The BBC did an article exploring the history of this treat and how it was banned in the USA. This is an interesting article that explores how climbing Mount Everest has changed since the 1950’s while also talking about the role Kendal Mint Cakes has played in that history. And of course you can check out the original shop that created Kendal Mint Cake on their website here. Oh and if you don’t want to try and make it yourself, or have issues getting the perfect creamy consistency, you can order it and have it delivered right to your door. I tried the recipe this morning. I put the mint cake into the fridge. It’s been in there for an hour. It is fudge-like but sticky. Following instructions, I stopped boiling process at 235F and dropped a tsp in cold water for a positive soft ball test. Should I just wait longer? Does it need to be chilled longer? Then what? Will it stay stiff after that or will it go back to being sticky if I bring it on a hike? Thank you for responding….